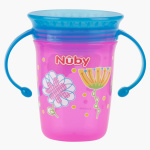 Nuby Wonder Sip Cup with Handle - 240 ml | Pink | Non-Spill. Featuring a fun print, this sipping cup will be loved by your child. It helps in easing out the transition between a cup and drinking glass. Owing to the handles your kid will find it easy to drink water or milk from this cup.